​Fernando was a dreamer. But he wasn't just any ordinary dreamer, his dreams were huge, colossal, as big as the sky, maybe even bigger. When Fernando was seven, he went to a travelling circus performance that came through his town. The huge red and white striped tent was set up in an open field on the far side of the village. Fernando was mesmerized by the bright colors, the noises of all the animals, the boom of the canon which shot a man up, up into the sky, and the daring of the lion tamers, their whips cracking in the air as the golden lions roared defiantly in their faces. But most of all, Fernando loved the trapeze swing. Two men and a lady swung on the trapeze high up in the tent, the lady getting passed back and forth between the swings, the men catching her in mid-air. With each swoop of the trapeze, Fernando's stomach did a swoop of its own and women in the audience would give a strangled gasp of fear. The performers looked like birds as they soared through the air, the bright blue tassels of their costumes flapping behind them. Fernando knew what he wanted to do. He was going to be a trapeze artist too. Fernando's father thought he was silly and he laughed when Fernando told him his ambition. His mother thought he deserved a scolding for dreaming such a crazy dream. His older brother said he would rather spend his spare time hunting pheasants out in the field than try to build a trapeze. But his little sister got a dreamy look in her eyes and said she would like very much to see Fernando fly. Fernando spent all summer practicing to fly on a trapeze. He made a swing out of a sturdy stick and extra long rope, attaching it to the eaves of his family's barn. He swung as high as he dared and practiced dismounting in a pile of hay. Then he practiced swinging even higher. By the end of the summer he could twist off the end of the swing, turning his body into complicated rolls and spins, landing on his feet in the straw patch. It was as close as he could get to really flying. But then one day Fernando's flying days came to an end. He finally convinced his mother and father to come watch him perform his best tricks. His brother and sister even decided to join them. They plopped themselves on the dirt ground and noisily cheered Fernando on as he climbed up the tallest ladder to the loft. He knew this performance was important, when his family would finally see what he had been working on all summer. He knotted his bright blue belt tightly around his waist, hoping it would give him luck. After a nervous smile and a big breath he gripped firmly onto the trapeze and stepped off the ledge. Down, down he plummeted until the ropes caught him at the lowest point of his swing. Then the trapeze made a giant swoop, sending Fernando high into the air. He could hear the ooh's and aah's from his family below. Higher and higher he swung, trying to get enough momentum to make an impressive dismount. The air whistled past his ears as he swooped back and forth in the barn. He wanted so badly for this to be perfect, to show his family what he could really do. He pushed himself higher and higher, higher than he had ever gone before. Then in a rush of excitement he released himself from the trapeze, grabbing his knees and pushing himself into a tight tuck. He was going to perform three flips in a row. Fernando knew that he could do it. Even though he had only ever done two flips in a row in the past, this time was different. He had pushed himself so much higher, there had to be enough time to add the third flip. Tucking as tightly as he could he pushed himself around and around. Then just as he was starting the third flip his eyes made contact with the ground. The pile of hay was no longer directly underneath him. He had shot right past it. This wasn't going to work. He didn't have enough space to complete the final flip. Panicking, he released himself from the tuck just in time to feel the hard ground as it crushed through the bones of his right leg, his mother's scream slamming into his ears, then everything went dark. When Fernando awoke, his leg was bound tightly to two long sticks to help the bones grow back together and he was stuck in bed for months. Fernando's trapeze was immediately taken down. A year later, after his leg was completely healed, he still had a slight limp. The village doctor said that he was lucky he didn't lose the leg. A limp was to be expected after what Fernando did to it. Year after year went by, and Fernando still dreamt about flying on his trapeze. He thought over and over again about what went wrong, what he would change, and how he could build a better trapeze, but anytime he so much as whispered one of his ideas his mother gave him a whipping, telling him to stop dreaming and get back to milking the cows. More years passed and Fernando still held onto his dream. He remembered how the smooth wood felt in the palms of his hands as he gripped it tightly. He remembered the way the wind would whistle in his ears. He remembered how the swoosh, swooshing of the trapeze felt, making his stomach swoosh along with it. But most of all he remembered how it felt when he would release his grip on the trapeze and soar through the air. The exhilaration, the feeling of weightlessness, the freedom. In his dreams, the times that Fernando spent soaring through the air seemed to expande and grow. He felt as though he must have been suspended for eternity before the final drop to the ground. He had almost been a bird, fragile and delicate, suspended in the sky, until his crashing fall. If only he could fly again. Fernando began to run. He found that if he ran fast enough, his leg would lose its limp, and he could almost relive that feeling of weightlessness. He ran and he ran. He ran into the town center market for all his errands. He ran out to the field when he needed to collect his father. He ran to the old white church on Sundays and ran all the way back home. ​The townsfolk thought it a bit odd, but they were used to Fernando's eccentricities. His parents just shrugged their shoulders. At least he was finally over his trapeze swing, they thought. But one day running wasn't enough. Fernando ran out to the field, where the hay had just been gathered into their huge bundles for winter. There were rows and rows of round bundles, almost as tall as Fernando. As Fernando ran toward the first bundle of hay he thought about the bird he used to be, the weightless, free, soaring bird which used to fly through the barn. He remembered the whistle of the air in his ears, the swoosh in his stomach, the release from everything connected with the earth. Fernando's feet left the ground. He was weightless again. The air was whistling in his ears. It sounded like a bird calling him from a long ways off. The swoosh was back in his stomach. It felt like it was going to flip over on itself. He was flying once more. Up and over the hay Fernando flew. His feet touched ever so lightly on the ground on the other side, but he did not stop. A few more steps and he was once again in the air, leaping over the second round bundle, the bright blue tassels from his belt flapping in the breeze behind him. 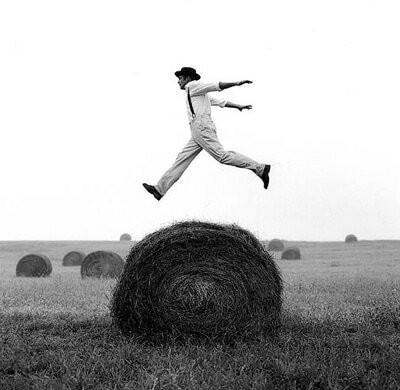 On and on he leaped until there were no more bundles of hay. He kept on going. He wasn't going to stop now. He took a few more light steps, his feet were as delicate and nimble as a sparrow, hopping lightly on the ground. He leaped toward town. And he kept on leaping. Fernando leaped over the old white church. He leaped over the town center market. He even leaped over the train station at the edge of town. He just kept on leaping until he made it to the sea. The air was crisp and salty here. A brisk wind swept the hat off Fernando's head and he watched as it sailed out over the water. There was no land in sight. Only miles and miles of gray water and white sky. But then he saw it, in the distance. It was so dim, his eyes could hardly make it out at first, but slowly, slowly he knew what he saw. It was a red and white striped triangle of a tent bobbing out on the horizon. Fernando knew that he found his purpose. Getting a running start, his feet barely even touching the ground, he leaped from the cliff's edge, pushing himself as far over the water as he could reach. The air was whistling in his ears. His stomach had a delightful swoosh in it, the biggest he had ever felt, and he was weightless and free once more. Fernando was not heard from again, but people in the village swore they saw a man who looked remarkably like him whenever the traveling circus came to town. And every time the red and white striped tent was set up in the open field on the far side of the village, it was bound to be a mesmerizing show, for there were elephants and clowns, lions and tightrope walkers, and even a man burst out of a cannon. But most importantly, there was a trapeze artist, with bright blue tassels on the edges of his costume, who seemed to just soar through the air like a bird. Some people even said that he didn't need the trapeze to fly. He was able to soar all on his own.